Well, we thought it would never stop raining but it did! The day started grey and overcast but in no time at all the sun came out and it was hot and humid again. Brief history of Savannah coming up! 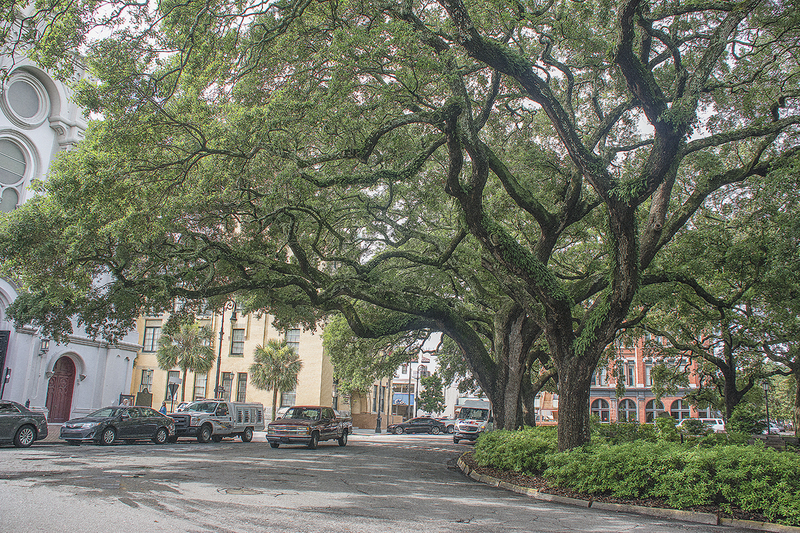 The city of Savannah, Georgia, was established in 1733. It is known as America’s first planned city and attracts millions of visitors, who enjoy the city’s architecture and historic structures. 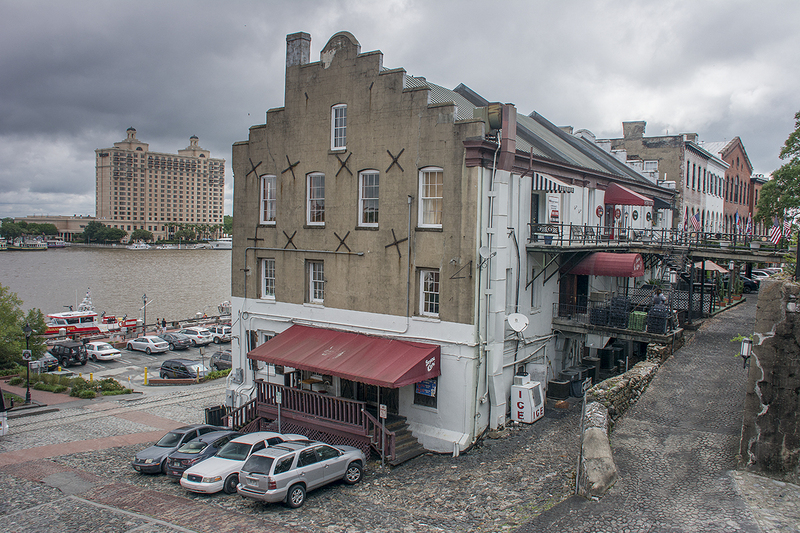 Savannah’s downtown area is one of the largest National Historic Landmark Districts in the United States (designated in 1966). In November 1732 the ship, Anne, sailed from Britain carrying 114 colonists, including General James Oglethorpe. On February 12, 1733, after a brief stay at Charles Town, South Carolina, Oglethorpe and his settlers landed at Yamacraw Bluff and, in an example of some of the earliest “Southern hospitality”, were greeted by Tomochici, the Yamacraws, and John and Mary Musgrave, Indian traders. 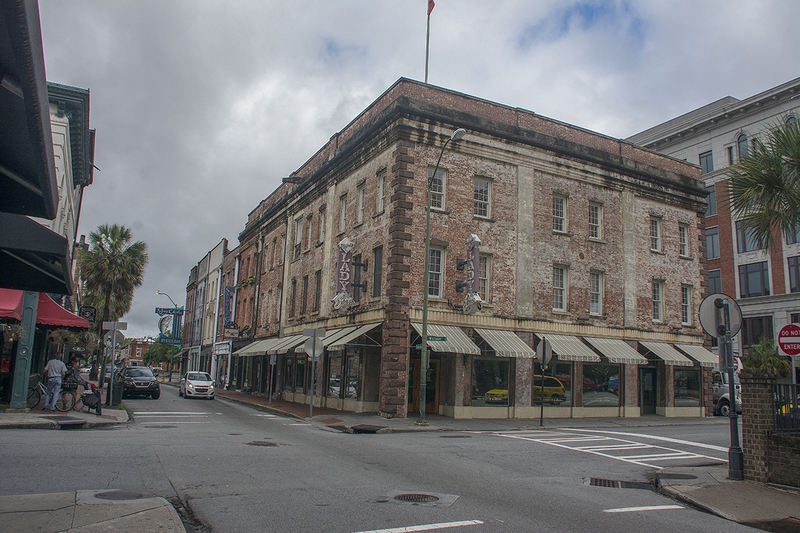 The city of Savannah was founded on that date, along with the Province of Georgia. Because of the friendship between Oglethorpe and Tomochici, Savannah was able to flourish unhindered by the warfare that marked the beginnings of many early American colonies. The city was laid out in 1733 around four open squares, each surrounded by four residential blocks and four civic blocks. The layout of a square and eight surrounding blocks was known as a “ward.” The original plan (now known as the Oglethorpe Plan) allowed for growth of the city and thus expansion of the grid; additional squares were added during the 18th and 19th centuries, and by 1851 there were 24 squares in the city. In the 20th century, three of the squares were demolished or altered beyond recognition, leaving 21. In 2010, one of the three “lost” squares, Ellis, was reclaimed. 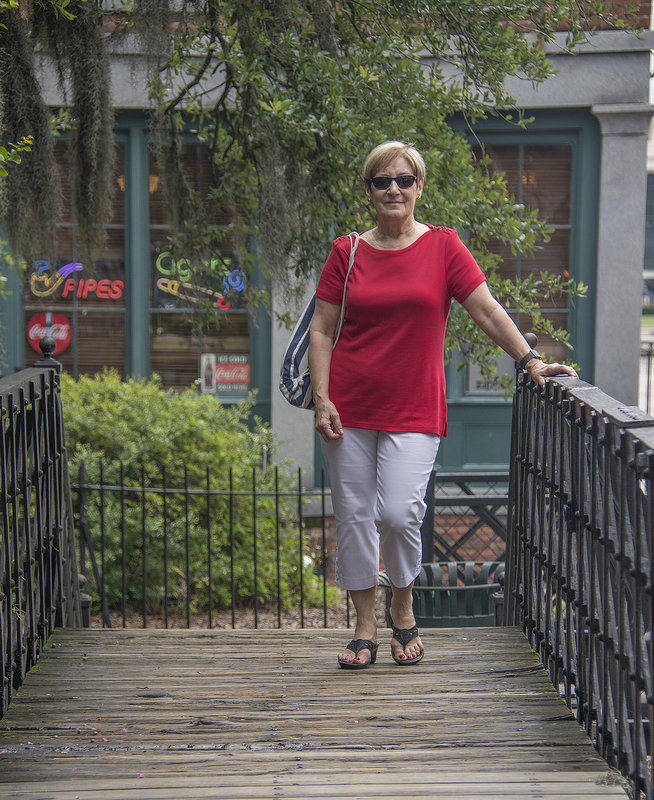 Most of Savannah’s squares are named in honor or in memory of a person, persons or historical event, and many contain monuments, markers, memorials, statues, plaques, and other tributes. Here ends the history lesson! So, this morning after a quick visit to the Post Office we visited some of the squares and one of which was Chippewa square. 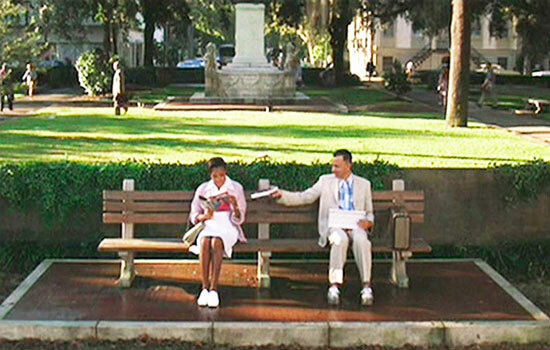 The square was named for the Battle of Chippewa and is famous for Forrest Gump’s bus bench. The bench was actually a Hollywood prop and has since been moved to the Savannah Visitor Centre. Also, this diner is where Jenny was working when she heard about Forrest’s run across America. Denise and Desiree, can you name the bird? 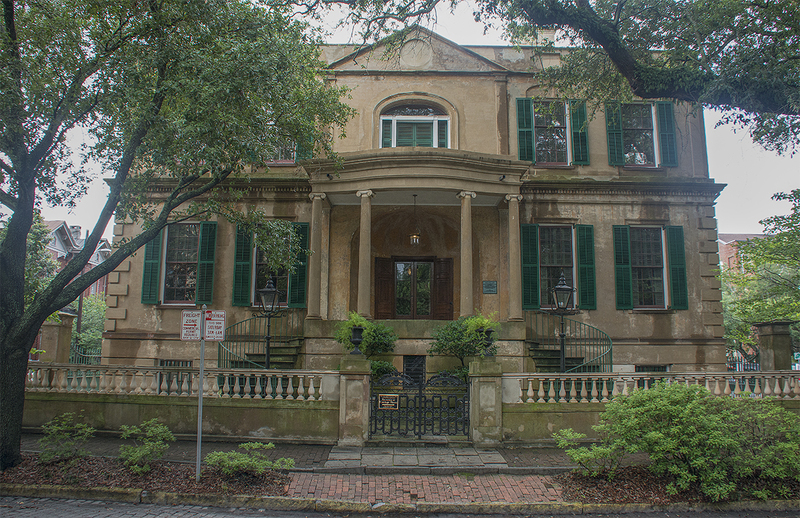 The Owens-Thomas House is a historic home and museum is on the northeast corner of Oglethorpe Square and was designated a National Historic Landmark in 1976, as one of the nation’s finest examples of English Regency architecture. 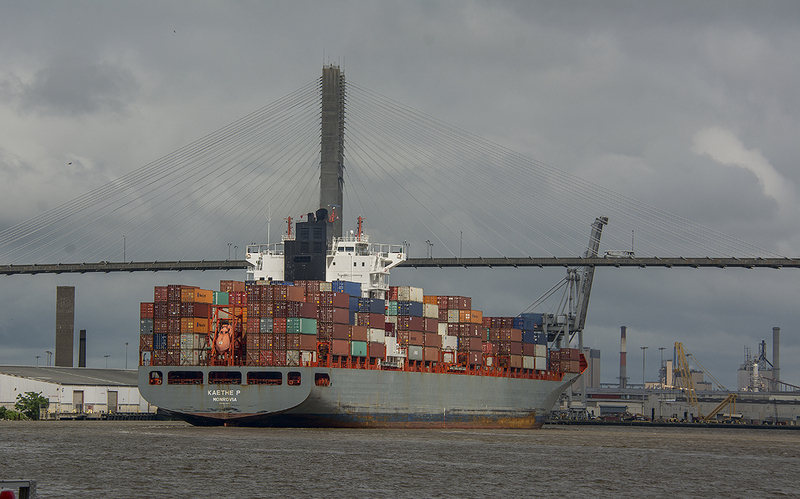 We also walked down to the water front and saw this huge container ship. At one point we feared for the bridge of the ship as we felt there was no way he was going to make it under the bridge, but of course he did! On our travels this morning we came across two lovely children with their Mum selling homemade lemonade in aid of a cat charity. 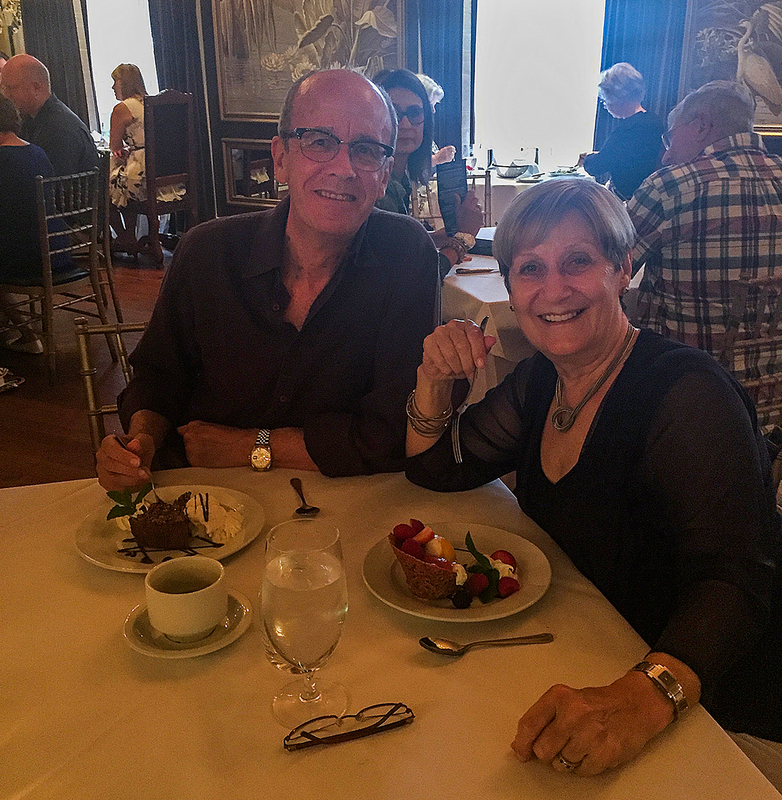 We purchased two glasses and told them we would include them in today’s blog. The lemonade was just what we needed, cold and very refreshing. So, Rafi, Lila and Mum Michelle, here you are! 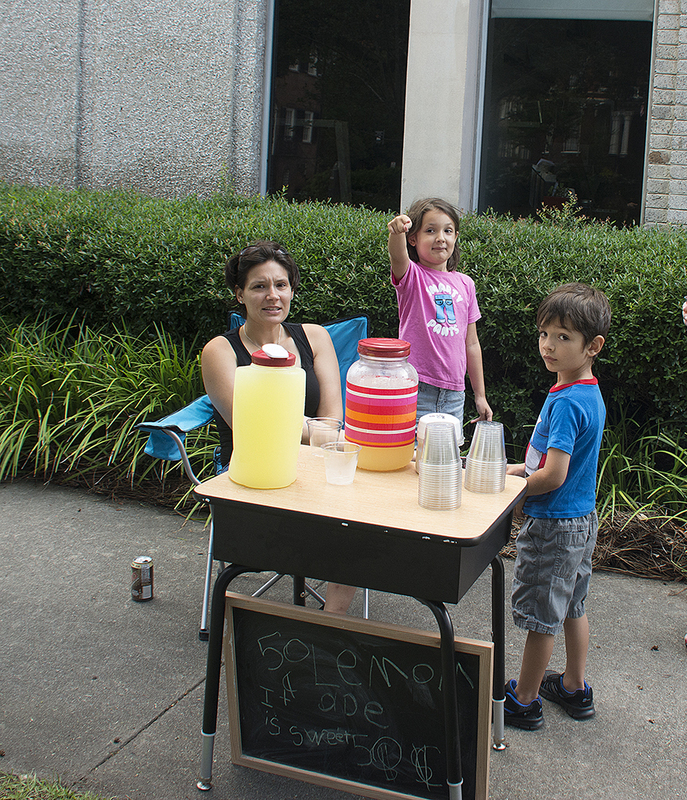 Michelle, Lila and Rafi selling their homemade lemonade! Today, I think for the first time on our trip we had lunch!! We happened across The Six Pence pub, together with the red British phone box outside, so decided that was the place to eat. The food was delicious. 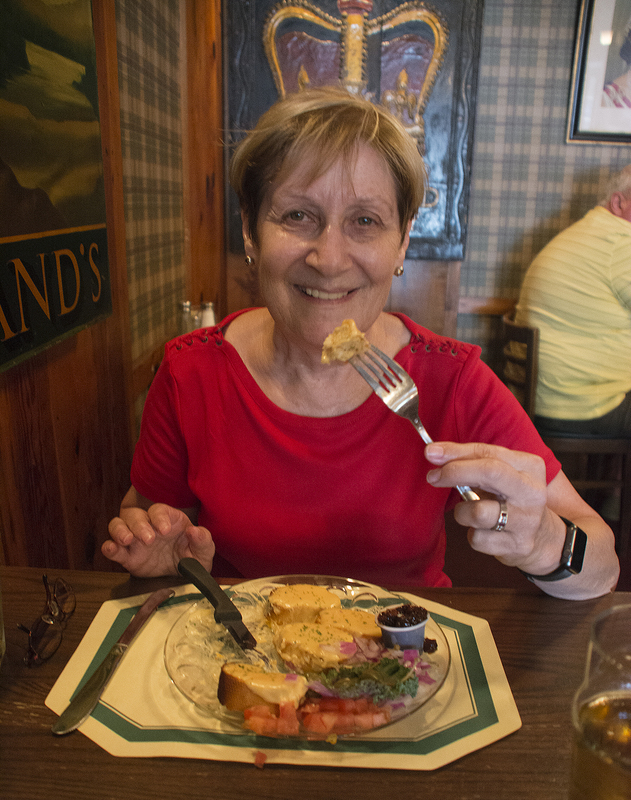 Listed on the menu was ‘Shepherd’s Pie (Cottage Pie) made from beef! We felt it our duty to point out that actually ‘Shepherd’s Pie’ is made from lamb and Cottage Pie from beef. I think they had probably been told that a few hundred times from visiting Brits! To make up for a lack of food photos recently Si took this pic. After lunch we decided to do a bus tour and spent a couple of hours being driven around the historic squares by our tour guide, Anna. She’s only been doing the job for a couple of weeks but she was very good and had us all in stitches. 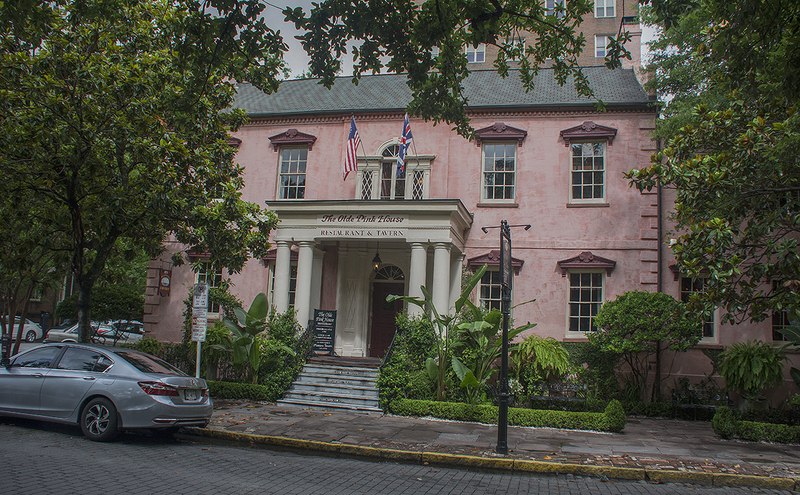 This evening for dinner we went to The Olde Pink House, Savannah’s only 18th Century Mansion which just happens to be situated next door to our hotel. 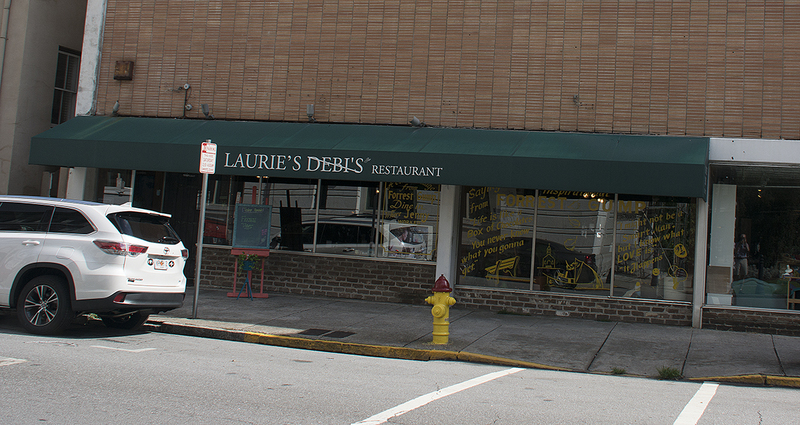 It’s one of Savannah’s most popular restaurants, offering new southern cuisine in a sophisticated, yet casual setting. 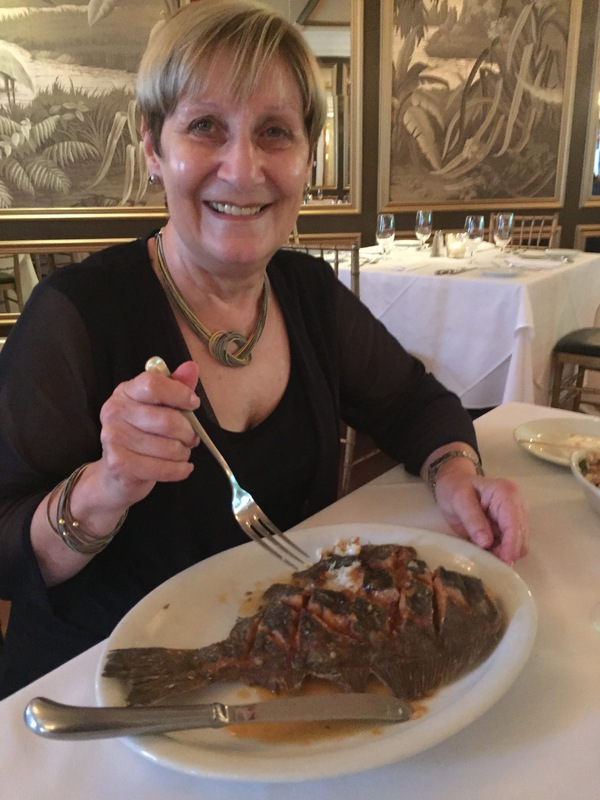 The food was excellent and we enjoyed it so much we are going back again tomorrow night for dinner! Si and Sand with their puds! Tomorrow is our last day in Savannah before we head back to Atlanta on Thursday for our flight home. 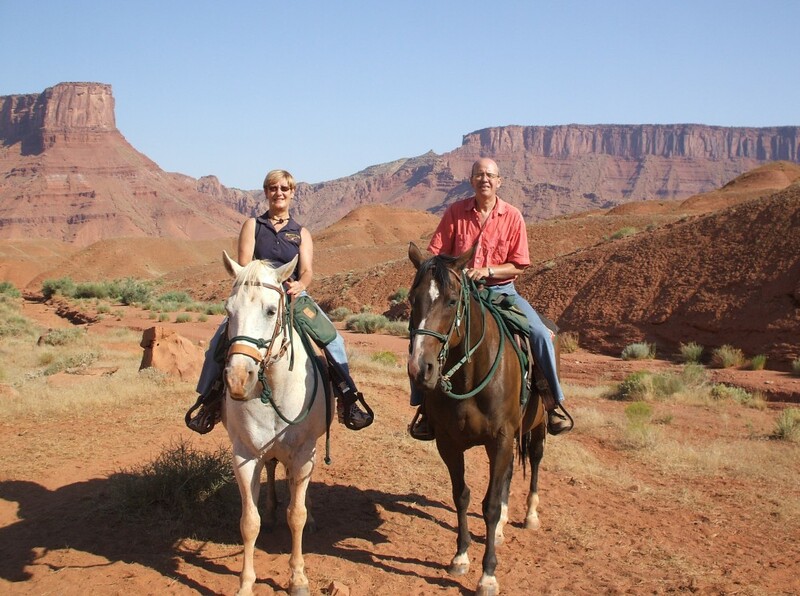 The weather is set fair so please join us again for our last day’s adventures. Good morning! 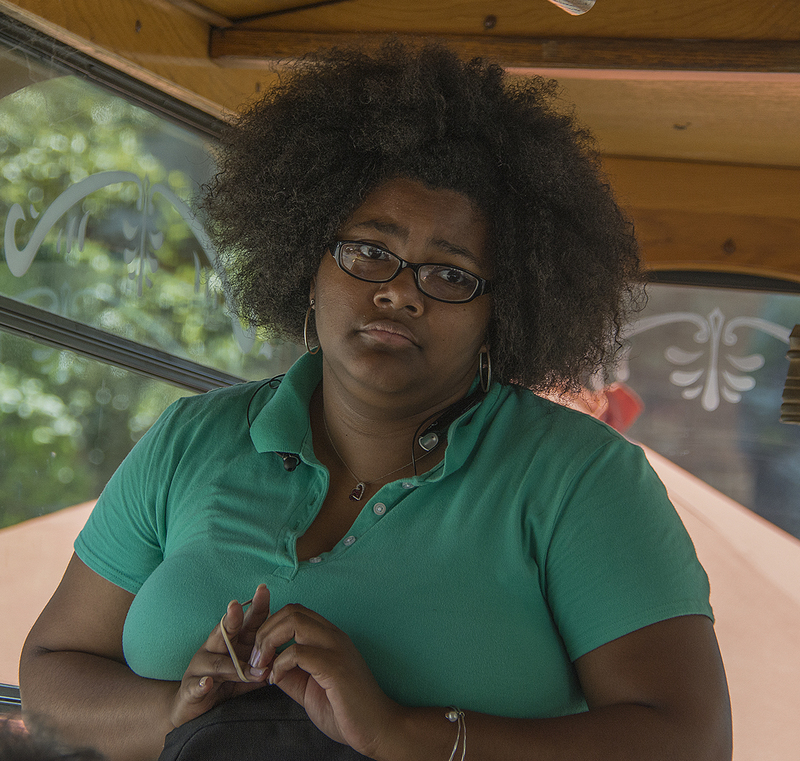 It looks as though you had a lovely first day in Savannah. I’m glad the weather cooperated! 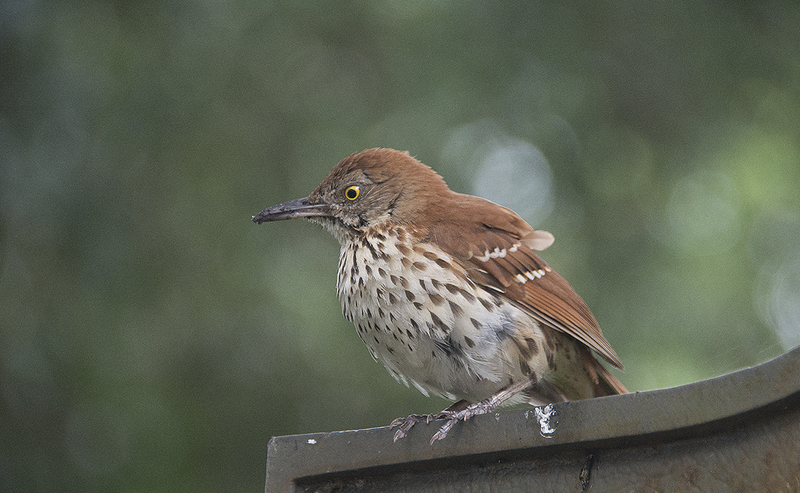 I’m taking a stab at your bird photo – it appears to be a Brown Thrasher which is the state bird of Georgia! Surely, he/she was welcoming you both to their great state! Enjoy day two! Oops! Brown Trasher (not thrasher). Thanks Desiree, I knew we could just count on you. Yes, the weather looks good for today too. Thanks Denise. I will right that wrong immediately. Thanks for the info. Your food pics made me so hungry this morning! I love soft shell crab, that was an excellent choice Si! Looks like you had another lovely day! I hope you do again today for your final day in Savannah! Thanks Nat. 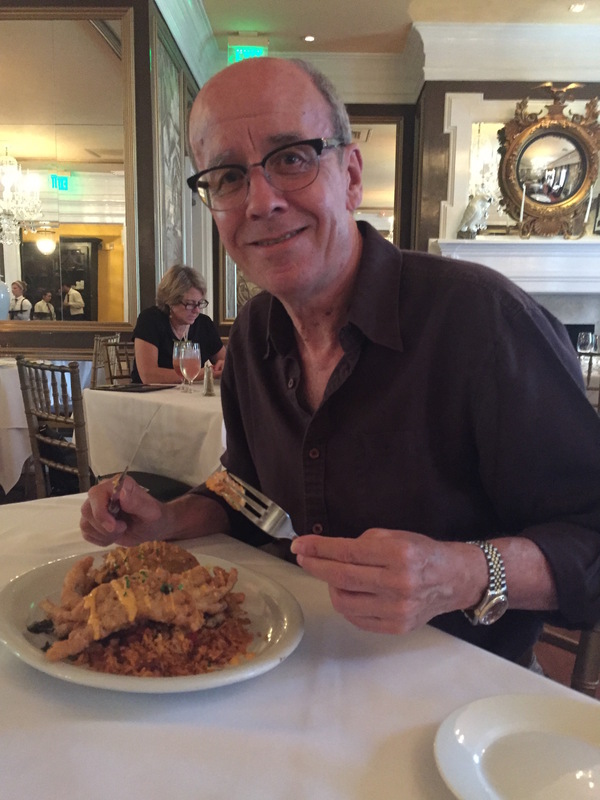 He does love his soft shell crab and they are not always on the menu. Going back again tonight! For some reason your blogs stopped coming!?! Your picture got highly commended tonight! The red silos in the green landscape in America. Right off to read the back issues I’ve missed. Travel safe. Hi Malcolm, thanks. We are having some problems with the blog. Ever since we arrived at this hotel my sidebar’s disappeared! The wifi is poor so it could be something to do with that! Was the intention all along to visit film locations or lucky happen-stance?